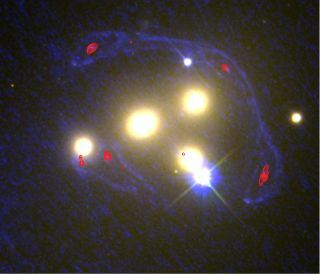 This image shows the four central galaxies in the Abell 3827 cluster with ultraviolet light from the Hubble images (blue) and infrared light from the ALMA observations (red). At these wavelengths, scientists can determine the extent to which a galaxy behind the cluster has been distorted by the gravity of the normal and dark matter. Dark matter has led scientists on a bit of a wild goose chase lately. New, more accurate measurements of a group of colliding galaxies appear to indicate that the mysterious substance likely interacts with itself and ordinary matter only via gravity, reversing conclusions scientists had drawn from observations three years earlier. Dark matter accounts for about 27 percent of the universe's contents, but scientists still know very little about what it actually is. It doesn't emit or reflect light, making it very hard to study. Its gravity can, however, bend the path of light in a phenomenon known as gravitational lensing, which has allowed astronomers to ascertain that something is out there. The same group of scientists revisited this observation for a new study with the Atacama Large Millimeter/submillimeter Array (ALMA) in Chile. The powerful telescope was able to pick out details that the Hubble observation hadn't caught: distorted infrared light from a background galaxy. The new data reveal the location of previously undetected dark matter around the collision. "We got a higher resolution view of the distant galaxy using ALMA than from even the Hubble Space Telescope," Liliya Williams, a researcher at the University of Minnesota and a co-author of the new work, said in a statement. "The true position of the dark matter became clearer than in our previous observations." The new picture that has emerged indicates that most of the galaxies' dark matter stayed with them during the collision. This suggests that dark matter either exclusively feels the effects of gravity or that it interacts only weakly via other forces. Alternatively, the cluster could be moving toward Earth, in which case we wouldn't expect to see any sideways displacement in the dark matter, the scientists said in the statement. If this were the case, the dark matter would have shifted either in front of or behind the cluster, making the offset hard to detect. The team will announce their findings on April 6 at the European Week of Astronomy and Space Science conference in Liverpool, England. Astronomers worldwide continue to look to the sky for clues about the nature of dark matter. In the past few years, many new hypotheses have evolved to explain the substance as scientists use computer models to get a better idea of what to look for. "Different properties of dark matter do leave tell-tale signs," Andrew Robertson, a researcher at Durham University in the United Kingdom and a co-author of the study, said in the statement. "One especially interesting test is that dark matter interactions [would] make clumps of dark matter more spherical," Robertson added. "That's the next thing we're going to look for." The new work will appear in the journal Monthly Notices of the Royal Astronomical Society.